Book 34 is a super short, super fast read full of ways to get started with coding in your own classroom/school! Brian Aspinall brings us Code Breaker as book 34 in the Dave Burgess Consulting, Inc line up. Brian is quick to explain that computer science is not only coding. It’s a way of thinking. He speaks to learning about coding as a language that our students should know, even if they are not planning to become professional programmers. Thinking through the process of writing code is about more than just creating a website or app. It’s about the critical thinking and problem-solving that is put into practice while writing the code. It’s about perseverance and finding those tiny mistakes that can negate an entire block of code. I love his analogy of coding being a part of computer science as biology is a part of natural sciences. That’s when the distinction really clicked for me in a way that I could share with others. Even if I weren’t already an advocate for teaching students how to code, I would be after reading Code Breaker! When I became a media coordinator at an elementary school in 2014, I heard about this idea of “Hour of Code” that was taking off in schools across the world. I knew my students needed in on this, so I partnered with our computer teacher and we created a schedule in which every student in our school (yes, even the pre-kindergarten students) would engage in coding within one day. It was fast and furious and so much fun! Our pre-k and kindergarten students enjoyed playing a game of Simon Says and following the tiles along the hallways of our school. They were learning the fundamentals of coding through playing a game they were already familiar with. They learned how the computer only does what the human tells it to do just as they only do what Simon says to do in the game. We then moved from analog coding (unplugged activities) to using code.org for our emerging readers. This is a great place to go for coding instruction, allowing learners (even you!) to move through a curriculum designed for any age group. Even though I’ve moved to a middle school, the Hour of Code has not only continued in that elementary school, but has spread throughout my district. If you’ve participated in the Hour of Code and are ready to move to the next thing in coding, check out Brian’s book! He gives many ways to integrate coding into multiple subject areas at a variety of ages. There are QR codes linked throughout the book to blog posts to further your learning, as well as examples and resources. At the end of the book there are several more resources, and educators to follow are listed throughout the pages of Code Breaker. I have some of my favorite resources to share with you as well. There are several unplugged games to get you started, too! Earlier this year, I facilitated a session on Coding Camps and shared our activities in a five day summer camp. That slide deck can be accessed here. 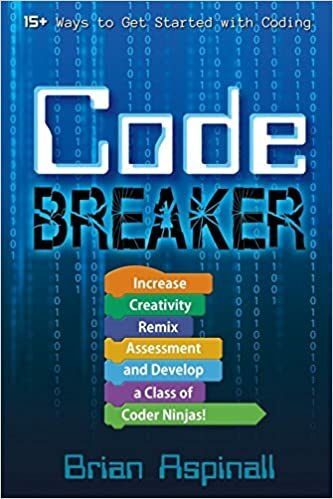 With the strides we’ve already made to include coding across our district, I was a bit apprehensive about how I could implement Code Breaker in the new school year. Luckily Brian provides to many new ideas that finding something to implement was incredibly easy! For this book, I will be working with my math team to use MinecraftEDU to show patterns in both constant rate of change and growing patterns as he describes in chapter 4! This experience fits perfectly in our curriculum and we already use Minecraft to do multiple lessons, so students will be excited to see it implemented in patterns as well! Brian provides excellent resources on his website. Brian has three TEDx Talks! Click for access to Hacking the Classroom, Education Reform, and Beyond Rote Learning. Don Wettrick (remember Pure Genius – such a good book!) interviewed Brian in his StartEdUp podcast. MindShare Learning did a video podcast with Brian, and The Ed Podcast just released a podcast with Brian earlier this summer about coding and why it isn’t necessarily the most important thing being learned (LOVE THIS!). As always, Andrea Paulakovich and I are copiloting a flipgrid which allows for collaboration on a global scale reflecting on each DBC, Inc book. Andrea had this incredible idea of using flipgrid at the beginning of the summer, and I was fortunate enough to get to be part of it! Feel free to share your thoughts with the community here; if no one has posted, be bold and start the conversation! The Twitter community uses the hashtag #CodeBreaker to discuss the ideas in this book. Speaking of Twitter, here are a couple of my reflective tweets while reading the book. Brian speaks so much truth in so few pages! Be sure to grab your copy now! I was excited to finally be able to read book 34 and am equally pumped to get to read book 35! If you’ve heard of The Ron Clark Academy and believe in what the educators there in Atlanta are doing for their students, you will also be excited about book 35! It was written by the husband-wife team of Wade & Hope King, educators at The Ron Clark Academy and is called The Wild Card. Prepare to be inspired to get creative with book 35!